TweetDeck : Dana Loesch The Constitution and our laws are social contract between people. If you violate that contract with a felony, the rest of society has the legal right to void the remainder of that contract with the offender, until such time as it determines. 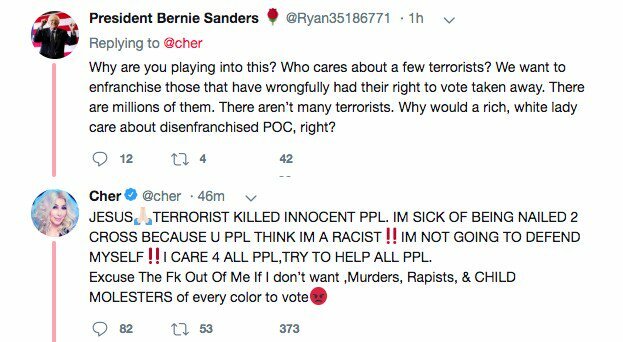 TweetDeck : You shouldnt feel like you had to delete this, Cher. Youre entitled to your opinion, and no one has the right to take that away from you. No one should be taken seriously for calling it a racist opinion, either. Its time to put an end to this. Its the real fascist threat. TweetDeck : The Washington Post Monica Hesse Because Linda Hamilton, Sigourney Weave, and Uma Thurman never happened right? TweetDeck : Difference btwn op-ed by NY Times editorial board “Phony Wall, Phony Emergency” & new column by lib Times writer Thomas Friedman as he admits-real crisis on border & best solution is “high wall w/ big gate”? Answer: Friedman actually went to border. TweetDeck : You still haven't explained to the American people WHY you want it released. TweetDeck : Ann Coulter If any other human being in this country had done what's documented in the Mueller report, they wouldn't have even been investigated in the first place. TweetDeck : Well why do you think that is?